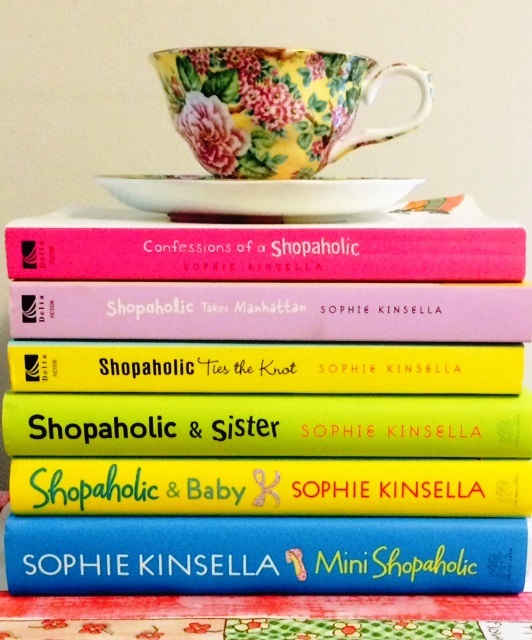 On Tuesday, I will be among the legions of Sophie Kinsella fans rushing to the bookstore to pick up a copy of Shopaholic to the Stars, the latest installment in her amazingly hilarious Shopaholic series. I can’t wait to catch up with one of my favorite heroines, Becky Bloomwood, and see what kind of hijinks she gets herself into this time. I also can’t wait to visit with one of the dreamiest guys to hit the page in the 21st century, our Literary Hunk of October, Luke Brandon. Luke Brandon. His name alone makes me feel like I’ve just licked an entire bowlful of brownie batter and all I want is more, more, more. Here’s what I love about Luke Brandon: everything. When Becky first meets him, he seems like just another 32-year-old millionaire with his own successful PR company, dashing suits, gorgeous eyes, a photographic memory and a genius IQ. Oh. You mean there aren’t a lot of those around? It may sound like Luke is too perfect to be true. He’s not. He’s got his flaws, like any human being. He works way too much and has been known to turn weekend getaways into business trips. At times he can be so driven that it blinds him to what’s going on around him. But you know what? His cow of a mother abandoned him when he was little and everything he’s done in life has been to win her approval, so cut him some slack and give him a hug already. The most lovable thing about Luke, of course, is just how much he loves our Becky. He’s the Ricky to her Lucy, not just putting up with her kooky adventures and overactive imagination, but adoring her for them. Not everyone takes Becky seriously all the time—what with her fibs about speaking Finnish, her certainty that she’ll take up fencing one day, her inability to walk into a card store and not buy every possible item she can get her hands on, because you really never know when you’re going to need last- minute pizza party invitations—but Luke recognizes just how remarkable she is. Who else but Becky would come up with the idea of banks having January sales? Luke and Becky complement each other completely. He even introduces her to the one sector of shopping she never realized she’d been neglecting her entire life: luggage. So come Tuesday, I will be at my local bookstore the minute Shopaholic to the Stars hits the shelf, and I will promptly devour the entire novel within forty-eight hours, just as I did with books one through six. And because my inner Becky is always ready to burst out, I may have to pick up a few other things while I’m there, because really—buying books isn’t really spending, is it? It’s more of an investment. Looking to see Luke Brandon in action? Hugh Dancy will melt your soul in the 2009 film adaptation of Confessions of a Shopaholic, starring the hilarious Isla Fisher as Becky. Miss the last Literary Hunk of the Month? Be sure to check him out–he’s good year-round. What a fantastic post, I love Becky, Luke and the whole Shopaholic Series. I’m getting this new book next week and can’t wait to read it. Great post. Thanks for sharing. Amanda. Thanks so much–I’m glad you enjoyed it!! Tuesday can’t get here soon enough! !